Home > Nachrichten > Kolloquium: Typoi. Greek Coins and their Images: noble issuers, humble users? 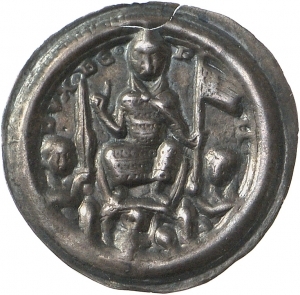 „The goal of the conference will be to discuss and explore the methodologies of reading images on coins while putting in the foreground the role of the “actors” of the issuing process. We insist here on the methodological approach of the conference. Since the 16th c. numerous studies have been consecrated to the images depicted on Greek coins. Most of them are concerned with the identification of numismatic types. In contrast, rare are those asking questions about the possible mechanisms preceding the choice of a type by an authority. The present conference intends to gather together specialists coming from different fields (working on different areas, periods, or specializing in media other than coins, etc.) encouraging them to propose an original synthesis based on their field of expertise. -What is the actual circulation of monetary images? -What are the differences and similarities with respect to the images produced in other media of similar (gems, intaglios, seals) or distant (vases, sculptures) sizes and qualities? For example: are we dealing with noble publics and users in the case of gems and intaglios and with humble users in the case of coins? -To what extend did the issuers draw on media other than coinage for their iconographic ideas? -Could users understand the “message” without the mediation of other media? -Which concepts and tools coming from different fields of research are likely to help our understanding of the type-choice process (the example of linguistics, the quantification tool, etc.)? -Are numismatic types over-commented by art historians (eager to use the term “propaganda” for every iconographic program) and under-commented by economists (more imbued with pragmatism)? We seek a balanced view. -What differences in meaning exist among the main categories of issuers (Greek cities, Hellenistic kingdoms, Roman Empire)? -Which types are not depicted on Greek coins and for what reasons? -Which are the external reasons and factors that may have determined the choice of iconographic types (monopolies, desire to mark the provenance of the mineral, need to differentiate the denominations, etc.)? -Can we detect a consistent program through metal and denominations of the same issue? -Can we detect a chronological evolution of the iconography in general (portraits, bodies, actions)? -To what extent did the indispensable confidence of the users determine the use of images easily recognizable by them (frozen types or re-uses of ancient types)? -Who decides the monetary iconography: the highest authorities or, as in the case of Republican Rome, junior aediles?